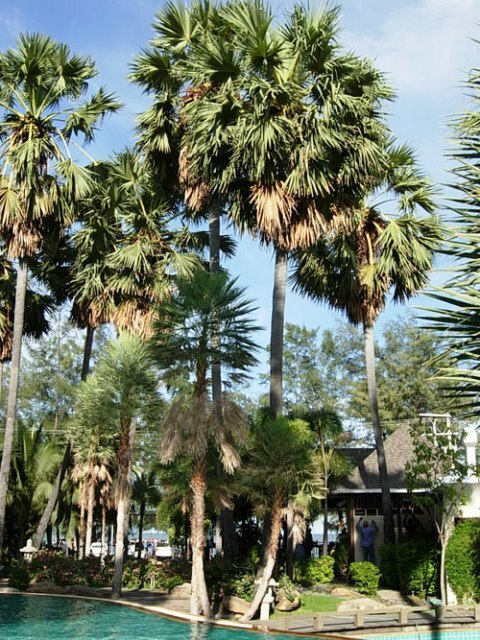 Taad is the most striking of the palms and is a grand feature in the landscape of tropical regions. Majority of botanists are of the view that this tree originated in India only. It is a very multipurpose tree with several other uses besides providing edible fruits. It grows wild in Many parts of India. Besiodes India, it also grows in Sri Lanka, Southeast Asia, New Guinea. 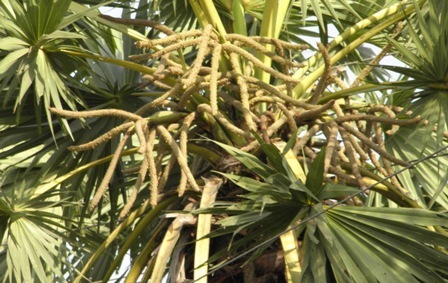 A very tall, erect magnificent tree (rarely hermaphrodite) palm, growing sometimes upto 30 m tall and 1-2 m in girth with large crown of 30-40 leaves; trunk blackish grey, cylindric, with a dense mass of long rootlets near the ground, generally straight, swollen above and middle and again contracting upwards, old stems marked with black, narrow scars of petioles, young stems covered with dry leaves or with the basis of their petioles. Leaves palmately divided, fan shaped, petioles 60-120 mm long, stout, semi-terete, spinescent-maginated lamina, 1-1.5 m wide, rigidly coriaceous, divided into lanceolate or linear2-fid lobes, segments 60-80, shining, folded along the mid rib, spinulose. Spadices very large, syout, male spadix stout, cylindric, branched or sometimes double; bracts enclosing spikelets. Flowers yellow; female spadix sparingly branched, flowers yellow, slitary, few, scattered. Endosperm forms the edible portion. 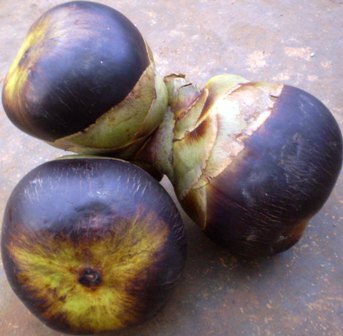 However, the fruits are harvested for sale when the fruits are tender. At that stage the seeds contain a soft, sweet, jelly like endosperm weighing from 30-60 g. These are very much relished, especially during the summer month when they make a cooling, delicious and even filling food. These are also sometimes cut into small pieces. Sugar and rosewater is added to flavour them and then eaten like ice cream. These are also quite suitable for canning in syrup. Later this jelly like pulp hardens into a bony kernel which does not remain of much use neither as fresh or preserved food. When the fruits mature, the fibrous mesocarp contains a soft, mellow, luscious, semi-sacharine, farinaceous pulp. This pulp is eaten raw. It is also mixed with flour and many food preparations are made from it. The pulp of dry fruit is also prepared into a dry tough. Leathery preserve. The spadices of taad yield a delicious sap after tapping. This sap is sweet and refreshing when taken right in the morning. 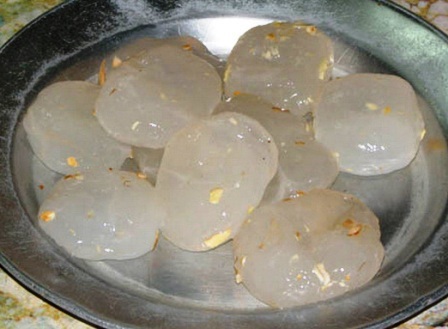 It gets fermented soon and turns into mild alcoholic drink after a few hours. This is a cheap and very popular drink with village people. The sap is also dried and made into jaggery and sugar. Taad jaggery is believed to have many useful properties and therefore sells at even a price much higher than that of the cane sugar. The wood and leaves are also used for several purposes. Taad just grows naturally and no particular care is necessary. It also does not requite any irrigation or manuring. It is generally propagated by direct sowing. The seedlings, however, take 12-15 years for cultivation.